Alt-country rocker Ryan Adams continues to grind out the promotion for his upcoming self-titled LP. Most recently, he appeared on The Tonight Show Starring Jimmy Fallon to perform the single "Gimme Something Good." With his instantly recognizable big hair and jean jacket, Adams led his band the Shining through the timeless rock song. For what it's worth, the backing band's lead guitarist was sporting an Alternative Tentacles t-shirt. 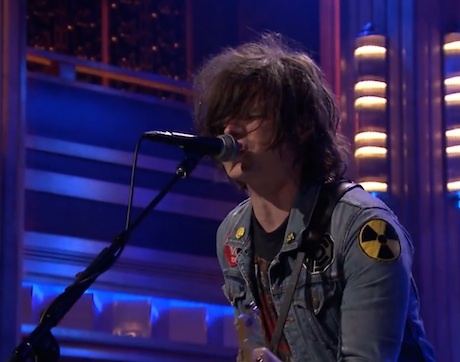 Watch Ryan Adams and his band perform on Fallon below. Adams' forthcoming self-titled record arrives on September 9 via Pax-Am.